Linlithgow travelled through to Broughton on Saturday with six changes in their squad from the previous week, all brought about by injury and non-availability. One of the changes, saw Duncan McClymont (photo left) make his Reds’ debut in the second row alongside Neil Lockhart. Out were Mark Green, Euan Mochrie, Lauchlan McCall, Cal Thomson, Stuart Cunningham and captain Craig Scott, while in came Duncan McClymont, making his Reds’ debut, Andrew Archer, Kieran Cochrane, Cammy Murrie, Stuart Jamieson and Calum McKeown. The original fixtures for the season had drawn Linlithgow away at Broughton on successive November Saturdays, first in the league, then in the BT Edinburgh Shield. With the agreement of the Championship Committee, the two sides decided to play just the one match as a double-header for both league and Shield competitions. The Reds won the toss and elected to play up the hill in the first half. Both defences were on top and there was good line speed and first up tackling from Broughton which prevented Linlithgow from getting into their stride. The only points from the first half came from the boot of Jack Frame with a well struck penalty, making it 3-0 at halftime for the Reds. In the second half, playing down the slope, Linlithgow were slow to get going and only really got into the game in the last quarter. 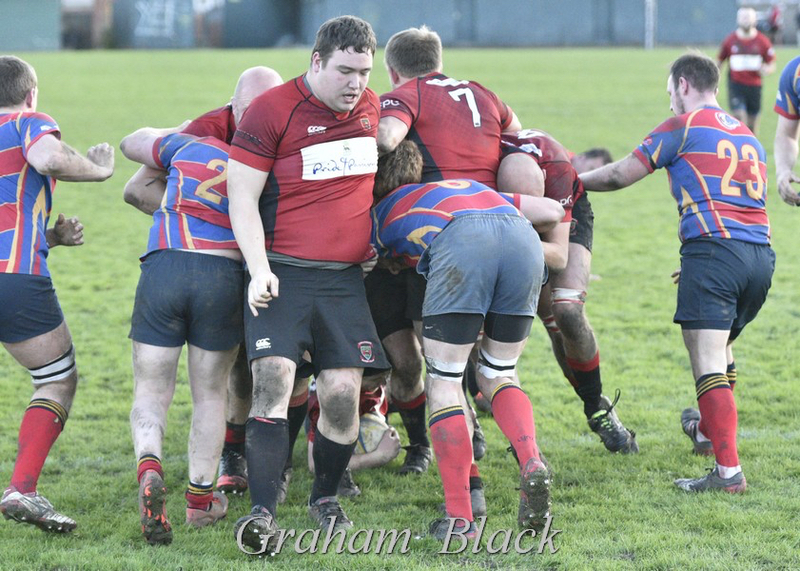 Jack Frame traded penalties with his opposite number to take the score to 6-3 and then, in the space of 10 minutes, Linlithgow lost two key players to injury, with first Jack Frame going down to a serious injury and then John Chapman having to leave the field with a head knock. Jack sustained a fracture to his jaw in an accidental collision and the good news is that he had a successful operation at St John’s on Sunday and is on the road to recovery – our best wishes go to him. During that period Broughton took the lead. However the Reds dug deep to find a way to win the match showing a decent bit of character. The Reds’ bench probably turned the match with Stuart Jamieson steadying the pack and Cammy Murrie and Kieran Cochrane, both looking really impressive, claiming the two tries (Cammy’s try left photo, Kieran’s try right photo) which drew Linlithgow level with Broughton at 16-16 with about 10 minutes to go. The equalising try by Kieran Cochrane was his first try for the Reds senior team and he couldn’t have scored it at a better time. 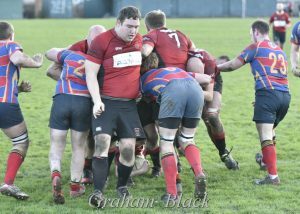 This is the same player whose pressure penalty the previous week had kept the 2nds unbeaten record intact in a fine away win at Peebles. 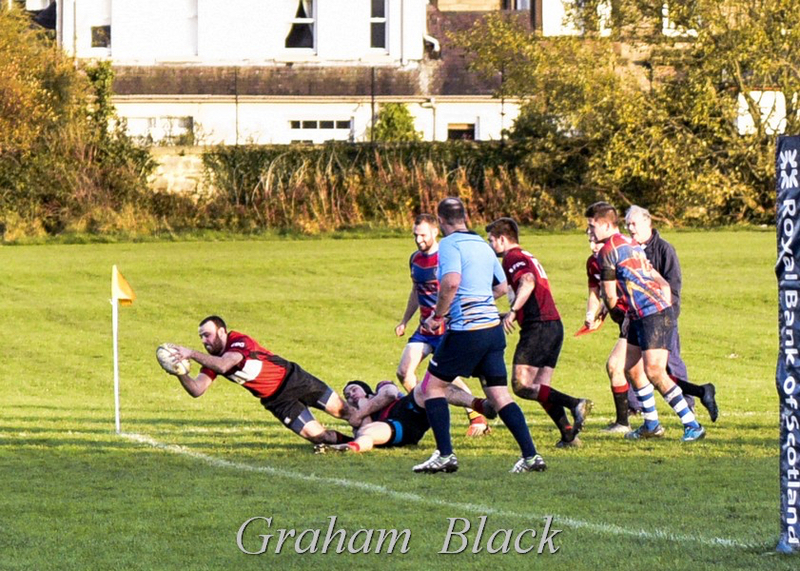 The next score was always going to be critical and, with Jack Frame off the field, it was Rab Cairns who stepped up to slot the winning penalty to give the Reds a 19-16 away double win! However, it still took desperate defence, including a last ditch tackle by Pete Millar, to hold the lead under a final sustained attack from Broughton. There was very little on the day between two very evenly matched teams. At one stage it looked like the game would be heading for a draw and extra time (for the Shield), but great character and a strong bench performance saw the Reds home. 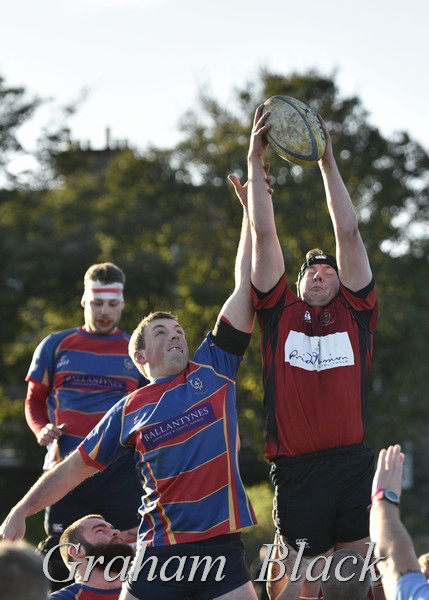 All in all, 4 league points and through to the second round of the BT Edinburgh Shield. Rab Cairns; Jack Frame, Peter Millar, Andrew Whitelaw, Gregor Stewart; John Chapman, Jamie March (captain); Ally McLean, Chris Archer, Michael Robertson; Neil Lockhart, Duncan McClymont; Andrew Archer, Ross Martin and Mark Caddle. Subs – Calum McKeown, Stuart Jamieson, Kieran Cochrane and Cammy Murrie.